You’ll flip for Idol Words | Word Search Game, a fast-paced word-finding adventure where you face off with friends to build words using ever-changing letters and powerful boosts. board, it will flip to reveal a whole new challenge! 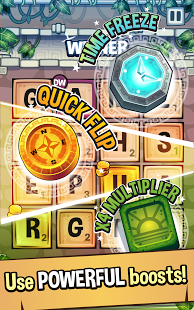 The more words you find, the more flips… the more flips, the more points! How many words can you search and discover? How high can you score? Your adventure awaits! Become the ultimate adventurer! ― An exhilarating journey through exotic temples awaits you! There are coins and glory for the taking. Can you rise to the challenge? Outplay your friends and family… or even the world! ― Challenge family, friends or random opponents to thrilling 2 minute battles; whoever has the highest score after 3 rounds wins! Tap into forbidden powers! ―Use legendary treasures to give your score a boost. Freeze Time, Flip the Board, or send your score soaring with a 4x Multiplier! Create a rumble in the Jungle! – Chat, brag and challenge with the Idol Words in-game chat feature! Ancient temples never looked so good! ― Enjoy gorgeous graphics fully optimized for your Android mobile and tablet! Install Idol Words | Word Search Game Game Today! © 2013 Outplay Entertainment Ltd. Idol Words is a trademark of Outplay Entertainment. All rights reserved. Fun Game I like this game. More stars if it wouldn’t freeze up every other game. Fun, timing you forget words. Help sharpen skills. Fantastic 🙂 it’s soooo addictive you wont put it down… Brill little game. 9out of 10 You have to have your brain in gear. it’s great fun.